This is the end result of Schnauss' obsessions with icy style electronic sounds and shoegazing aesthetics. 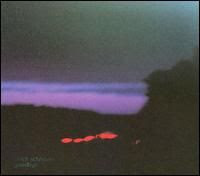 Here we have a digital shoegazer classic that I feel ranks only a tiny cut below the best of My Bloody Valentine or Slowdive. A big development here is that Schnauss seems to have really focused on pure songwriting. His earlier album featured fine melodies and a few nice vocal hooks, but they still had the 'sound sculpture' feel that often shapes straight up electronic music (not that I dislike it - I typically take the 'sound sculpture' approach to my Damaged Tape compositions). Here, several songs are fully formed as a good rock band would do, or in Schnauss' case a good shoegazing band. In fact, while close scrutiny does reveal the hand of a skilled electronic producer, Goodbye often has the feel of a band recording - of course a very trippy band. "Never Be the Same" is a nice announcement that Schauss will be going for a purer shoegaze sound with some fine female vocals and the trippy walls of echo in full effect. Schnauss typically appropriated the textured clean sounds of the quiet side of shoegazing, but on "Stars" he finally tackles the full on distorted guitar roar of My Bloody Valentine, and it results in one of his best tracks. Schnauss then indulges in several great, more ambient tracks - he is a master of this kind of tune - before opening the sonic gates of distortion once again on "A Song About Home." The guitar riff is a little reminiscent of Slowdive's "When the Sun Hits," but I'll give Schnauss a pass as that Slowdive track is one of my favorite songs in general. "Goodbye" is a nice crossroads of all of the styles Schnauss typically mines - perhaps he's suggesting that his next original album (which we're still waiting for in 2011!) will try something entirely different. If this is 'goodbye' to Schnauss' shoegazing obsession, then this album is a fine send off. I just hope that he didn't mean 'goodbye' from music as we're still waiting for more (Schnauss did release a remix collection a year or two ago). But for you aging hipsters out there that can't get enough of these sorts of sounds (and hopefully a few of you young pups as well), then Goodbye is one of the best recent showcases you're likely to find. 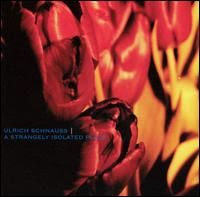 Ulrich Schnauss doesn't make a drastic change in his sound on A Strangely Isolated Place, but he mixes up the details just enough to keep things interesting while generally maintaining quality control. Whereas his debut album was very cold and clean sounding, he grunges up the production a little bit for many of these tracks. They're still chilled out electronica with a shoegazing aesthetic, but the atmospherics end up much more varied with some distorted drums and high altitude crackling. 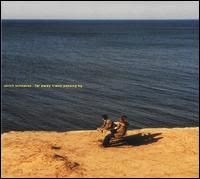 "Gone Forever" is the poppiest that Schnauss had gone up to this point, with an ethereal vocal hook serving as the signifier of the track. A propulsive bass line and a buzzsaw synth pushes "On My Own" a little harder than Schnauss had attempted up to this point. "Monday - Paracetamol" has a dirty, underwater sound that I suppose perfectly rflects the title, while "Blumenthal" has some huge synth that ramp up the ambient aspects. In fact, I would have been happy if the track never developed into a full blown production, although I have no complaints about the chiming melody in the second half. The title track is a multi-part affair which also does a fine job with ambient sections while also managing a spot of grungy shoegazing in the middle. This is often cited as Schnauss' best LP, although I'd have to say it's actually my least favorite of his albums so far. That's not to say I don't like it - I do - but these tunes don't quite burrow into my brain the way some of his other efforts do. You may have a different reaction to this sonic narcotic. I've been digging this one on a pretty regular basis for the past three-and-a-half years. This very psychedelic synth loaded band hails from Pennsylvania and can rightfully lay claim to one of the trippiest pop albums of the past decade. There's plenty of novelty on this record with all of the vocals being run through a vocoder and plenty of goofy analog synths sounds often competing with mellotrons (or a good approximation of one). Still, the band steps up to the plate with some great songwriting and top rate psychedelic atmospherics. This is an album that washes over you entirely, and there's not a bum track among the bunch. Even some of the experimental tracks rise above the 'filler' status as they do a fine job of transporting the listener through the album. I will give you a few starting points, though, to get you hooked. "Jump Into My Mouth and Breathe the Stardust" comes across as Beck on quaaludes with it's crusty acoustic guitar riff occasionally becoming overpowered by huge washes of mellotron, synth, and strange sound effects. "Lollipopsichord" seems to physically twist your mind with its reality bending synth riff. Actually, I think this would have been a fantastic album opener. The band does a fine job of building off of French electronica bands like Air and Mellow - "When the Sun Grows on Your Tongue" definitely would have fit well on one of Mellow's albums as a standout track. This is an album that begs for plenty of repeat listening. 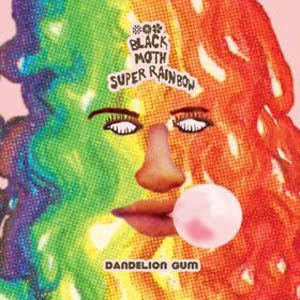 Although many of the influences are clear, Black Moth Super Rainbow certainly appropriates them into a very groovy sound trip. If you have the opportunity, I'd recommend picking this up on vinyl. The trippy cover art is also bubblegum scented and the discs themselves of printed on strange bubblegum coloured vinyl. 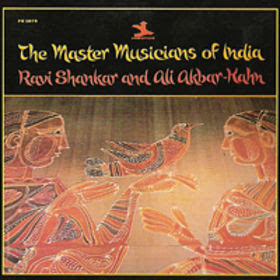 One would expect much from a collaboration between Ravi Shankar and Ali Akbar Khan, two of India's most revered classical musicians, and this album does not disappoint. Shankar is probably the most visible Indian musician to westerners, and of course has done much to bring that music to the West. Khan is the 20th century participant in a family chain of master sarod players (the sarod is a sort of Indian lute) which stretches back to the 16th century. This music is firmly grounded in Indian musical traditions, and manages a rarified mystical aura that only the best musicians can achieve. I'm not sure on the particulars of this set (1995 is simply the tag on my files), but I believe that the first two tracks are from concert recordings in the early 70's, while the third track is a bonus track. Feel free to correct me. Both the recording quality and the intensity of the music seems to build throughout this album. "Raga Palas Kafi" evokes primordial awakenings, with the string players weaving around each other mostly unaccompanied (some tabla begins pulsing in the last few minutes). There is far more tabla in "Raga Bilashkani Todi," allowing the music to ground itself a little more after floating through the vapors of the first track. It's worth noting that Shankar and Khan manage a perfect synergy, with neither pushing forward too much, but both making their musical identities clear. The third track, "Bangla Dhun," has a much more festive, lively sound, with very defined melody lines and a jolly roll to the tabla beat. Regular readers of this blog are probably aware that I consider Indian music to be just as, if not more psychedelic, than the freakiest of 60's rock. This album has nothing but the ethereal sounds of Indian classical music, but it is definitely music that speaks directly to your mind's eye. It doesn't get much better than this with two masters performing at the top of their game, so I can recommend it without reservation.